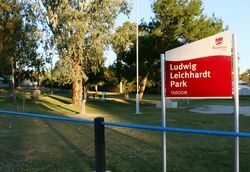 A monument commemorates the 175th anniversary of Ludwig Leichhardt who was the first European into the area. Leichhardt not only passed through Taroom but actually carved his initials in the old coolibah tree which stands right in the middle of the main street. On this tree, on his dubious and ill-fated expedition from Jimbour to Port Essington, Leichhardt carved `L L 44` (Ludwig Leichhardt 1844). Leichhardt, when he did finally get back to Sydney in early 1846, declared the countryside around Taroom was magnificent and, within months, there was a grab for land. Erected by the Taroom Historical Society and the Taroom and Wandoan District Tourist Association to celebrate the Bi-Centenary of Australia. Unveiled 23rd October 1988 to mark the 175th anniversary of Leichhardt.